SUMMARY: Picks up from the end of The Darkest Minds, where Ruby has reluctantly joined The Children's League, an organization determined to take down President Gray and the detainment camps for teens with psychic abilities. As a League agent, Ruby is given an assignment--to track down Liam and bring back a classified flash drive he unwittingly took from his brother Cole, also a League agent. REVIEW: Rest assured that this review will remain spoiler-free! The Darkest Minds was one of my favorite books last year, and probably among my top ten YAs of all time. Yes, it's THAT amazing, and if Hollywood does not make a movie of this series, they are missing a huge opportunity. So, Never Fade. First off, it took me about 200 pages to get into. While there is some backstory throughout this one, I was pretty lost for awhile since I read TDM about a year ago. Once I got into it though, I could NOT put it down! Many characters from TDM return (yay! ), and several great new characters are introduced. I absolutely adored Jude, Vida, and Cole especially--GREAT additions to the story! Though Bracken is a fairly new author (TDM is her only published series to date), she is among the best YA writers I've seen. Bracken has a way of really making her characters come to life. Readers will CARE about these people--for both books, I was actually sad to finish. I already miss my psi friends! 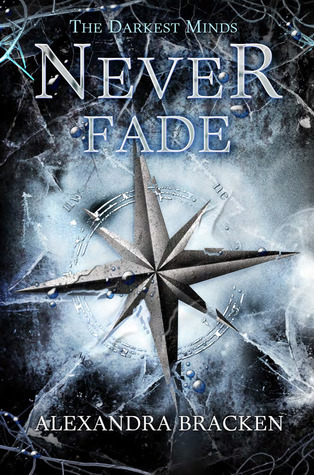 I will say that though I really enjoyed Never Fade, it is definitely not as strong as TDM. I bawled like a big baby at the end of TDM, but Never Fade ended really abruptly. Could it be that there was something wrong with my NetGalley ARC--is the story supposed to end in a question? Like, an actual question? Surely there was another chapter or something missing. The NG copy was 507 pages, but Goodreads lists the book at 512 pages. Additionally, there was absolutely NOTHING after page 507. No Acknowledgements, no author bio, nothing my NetGalley copies usually have. Anyone else have this issue? Romance is still part of the story, but it takes a backseat to the almost nonstop action and development of the politics of this post-virus America. I honestly didn't understand all the politics, but that's likely because I skimmed some of the political talk. I will scream if two particular characters don't get together in the third book (if you've read NF, you know who I mean!). These two people are two peas in a pod--the verbal banter between them was just PERFECT for their characters! Okay, now I feel like I need to read both books again and keep a list of all the color stuff! I do plan to check out Bracken's "bridge" novella, In Time, which tells Zu's story after she left Ruby, Liam, and Chubs in The Darkest Minds. THE BOTTOM LINE: While Never Fade wasn't the crazy-amazing experience as its predecessor (I didn't cry this time), it was still pretty darn good. Tons of action, complex character development, and close attention to details make this a trilogy you absolutely cannot miss. Don't panic if you have difficulty getting into the story--keep reading and you will all of a sudden notice you've read 100 pages without even realizing it! STATUS IN MY LIBRARY: Though I have The Darkest Minds in my library, I am not sure about including Never Fade. It has waaayy more language than TDM, and the violence is much more intense in this one. It might be a good choice for my high school section. I recommend TDM frequently to my post-apocalypse readers, so I probably need to at least have Never Fade available. I know it will get many requests! Alexa, I got it from NetGalley. It's free and absolutely amazing--check it out!